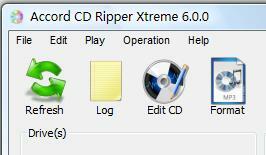 Accord CD Ripper is an allround and powerful audio CD extracting software. Accord CD Ripper can rip audio CD tracks to WAV, MP3, WMA, OGG, APE, FLAC, MP2, VQF, AIFF, AIFC, AIF, 3GP, AAC, M4A, M4B, MP4, MPC, MP+, MPP, WV etc.Secure CD ripping. Four build-in advanced disc error correction strategies: BURST, SYNC, SECURE and PARANOID. Three choices of actions on reading or synching an error during ripping: STOP and SILENCE. ...... Three choices of actions on reading or synching an error during ripping: STOP and SILENCE. CDDB info can be edited/revised/saved/submitted. On-the-fly ripping, no temporary file generated. Fully visualize the ripping process and real time display the spectrum of audio data. Elegant and intuitive user interface, very easy to use. Write metadata of the output audio files and create cue sheet & M3U playlist file. Build-in latest Lame MP3 encoder which is generally believed as the the best MP3 encoder in the world. Windows Vista compatible and works with Windows 7 (32-bit and 64-bit). Qweas is providing links to Accord CD Ripper Professional 6.6.5 as a courtesy, and makes no representations regarding Accord CD Ripper Professional or any other applications or any information related thereto. Any questions, complaints or claims regarding this application Accord CD Ripper Professional 6.6.5 must be directed to the appropriate software vendor. You may click the publisher link of Accord CD Ripper Professional on the top of this page to get more details about the vendor.